Duo Dillon-Torquati will be on Tour in February, starting with 2 concerts in Italy on 2nd and 3rd, then in Germany (on 9th in Stuttgart) and Denmark (on 13th in Copenaghen). The program will feature a rare transcription of Brahms most lyrical Sonata op. 78 in D Major, which will be part of the new All-Brahms CD of the Duo. Beside two important works of French repertoire, Debussy Sonata and Fauré seminal Second Sonata. 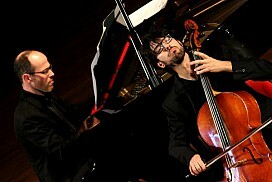 Venues will be Torri dell’Acqua in Budrio (Bologna), Amici della Musica di Modena, and Italian Cultural Institutes in Stuttgart and Copenaghen.